Boardgame bits fun­nel trays — hold­ing Fate and Hon­our tokens from Legend of the Five Rings (2017). I’m really happy when I can com­bine two of my hob­bies. This time it’s Boardgam­ing and 3d Print­ing. Often, many games have tokens or chits that are pooled for play­ers to take at dif­fer­ent times dur­ing play. Usu­ally, these sit in piles around the main game area. On Thingi­verse, swholmstead shared this neat design — which I promptly down­loaded and prin­ted. Super Effect­ive! 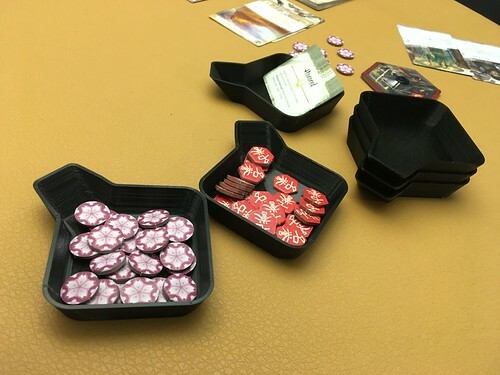 Keep­ing the game table neat and tidy.